From ancient times in Japan, it was considered a taboo to create portraits of aristocrats during their lifetime. 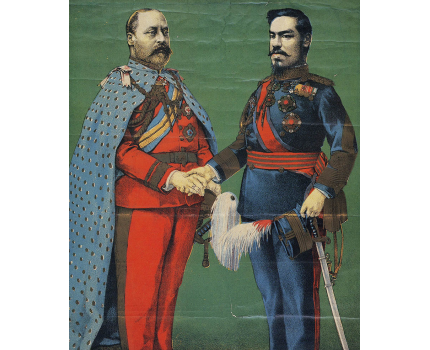 However, with the start of the Meiji Restoration in 1868, portraits of the Emperor were needed to confirm his role not only as the imperial head but also as the force behind Japan as a modern nation state. The portraits of the Meiji Emperor created during this period are called “goshinei” (“sacred image”) and became an object of veneration. At the same time, they also became an object of curiosity amongst the public and were widely disseminated. Nevertheless, it is important to note that the portrait’s public popularity was measured so as to not threaten the Emperor’s sacredness. In fact, caricaturing or satirising the Emperor was a criminal offence under defamation and left little room for circulation of imagery of the Emperor that was remotely considered disrespectful. Shioya Jun is Head of Modern/Contemporary Art Section, Department of Art Research, Archives and Information Systems at the Tokyo National Research Institute for Cultural Properties (Tobunken), where he has worked since 1998. Prior to joining Tobunken, he worked as a curator at Yamatane Museum of Art in Tokyo. He is a specialist in history of modern Japanese art with a particular interest in nihonga. He has edited a series of scholarly publications including Yokoyama Taikan: Mountain Path, volume six of Artwork Archive for Art Studies series (Yokoyama Taikan Bijutsu Kenkyū Sakuhin Shiryō Dai 6-satsu, 2014). His most recent co-authored publication is Creating the Image of a Modern Imperial Family, The Meiji and Taisho Periods, volume six of Art History of the Imperial Court series (Tennō no Bijutsushi 6, Kindai Kōshitsu Imeeji no Sōshutsu, Meiji-Taishō Jidai) (2017), for which he won the Ringa Art Encouragement Prize.